When it comes to under-rated hiking trails in the Big South Fork National River & Recreation Area, there may be none that draw a shorter stick than Blue Heron Loop on the north end of the national park, near Stearns, Ky.
Locals on the Kentucky side of the park are quick to tell you that the Blue Heron Loop is tough to top. But many on the southern side of the park are still learning about this 6.4-mile loop trail, which explores both the plateau top and river gorge around the historic Blue Heron mining community and the Devils Jump rapid. In fact, Blue Heron Loop may very well be among the top five hiking trails in the entire 125,000 acres of the BSF when it comes to scenic vistas and cultural sites. 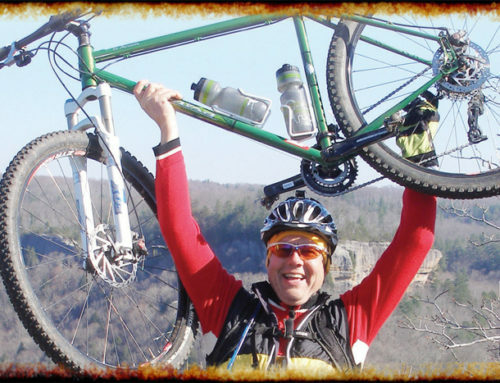 The trail is steeped in natural beauty and jam-packed with interesting features, such as the Devils Jump Overlook and the Cracks in the Rock — and, of course, the old mining community that lends its name to the trail. 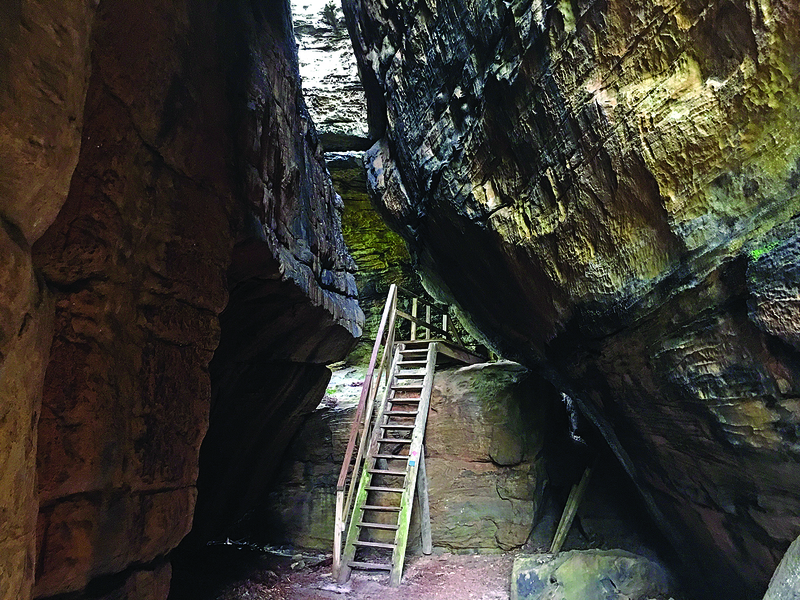 At nearly six and a half miles in length, the Blue Heron Loop is one of the longer day hikes in the Big South Fork NRRA, but it isn’t the toughest. 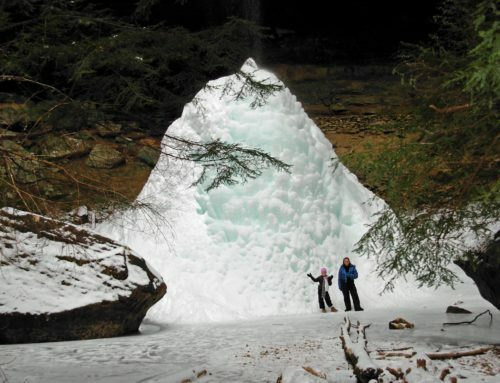 It draws a difficulty rating of moderate, which ranks it below such hikes as Honey Creek, Hurricane Ridge, Leatherwood Loop and Angel Falls Overlook. 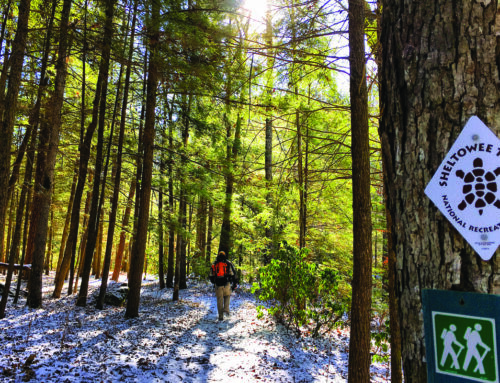 With the exception of the elevation change as hikers climb from the river’s edge back to the top of the plateau, the only thing that makes Blue Heron Loop a challenge is its length. And Cracks in the Rock along makes the distance worth it. 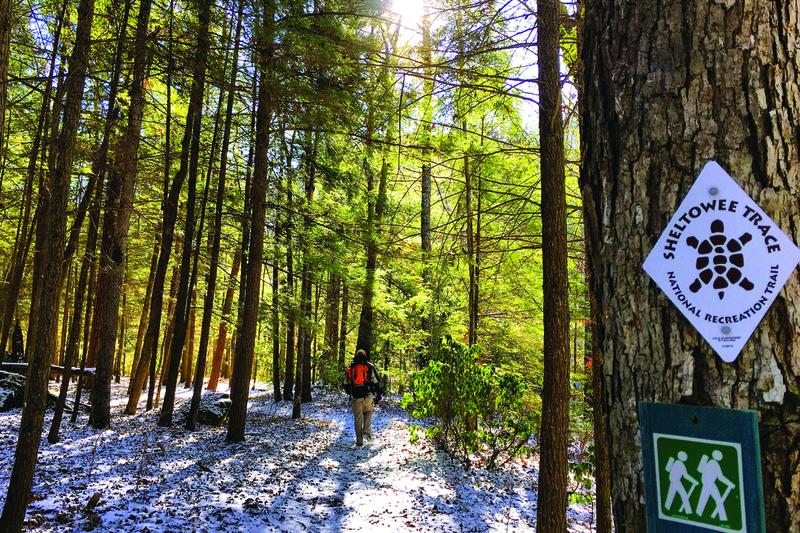 From the trailhead off Ky. Route 642, the trail is best hiked in a counter-clockwise direction, which means taking a right at the end of the short spur trail that leads to the loop trail. The first half-mile or so of the hike is relatively uneventful, paralleling the paved roadway as the trail works its way along the ridge top towards the edge of the gorge. But the pace picks up quickly after that, with Devils Jump Overlook being the first interesting feature. The overlook is actually handicapped-accessible, meaning there’s a paved walkway that leads in from a separate parking area. The loop trail intersects the paved walkway and turns right; going to the overlook requires a brief detour by turning left. 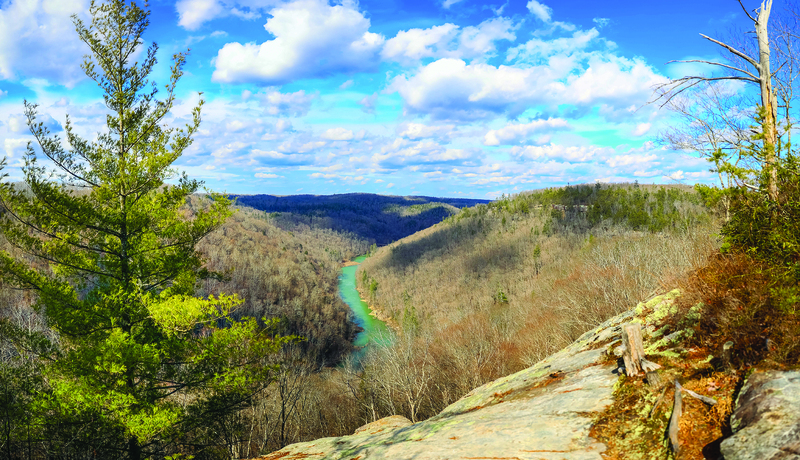 It’s well worth the additional tenth of a mile or so to see the stunning view of the Big South Fork River both upstream and downstream of Devils Jump. There are many stories about how Devils Jump got its name, but one thing that’s for certain is that it’s one of the two most dangerous rapids along the BSF River, along with Angel Falls further upstream. It’s also the free-flowing river’s last hurrah before it meets the harnessing power of Wolf Creek Dam much further downstream on the Cumberland River. Beyond Devils Jump, the BSF flows meek and mild until it empties into the Cumberland River at Burnside, Ky.
Back on the main trail, the pavement soon ends and the trail turns back to dirt as it continues along the edge of the gorge, dipping beneath the bluff line that caps the gorge. The roar of the white water tumbling over Devils Jump can still be heard through the trees, until the trail turns away from the river and begins to work its way into the gorge. Soon after the turn away from the river, there’s a spur trail leading to Blue Heron Overlook, another picturesque vantage point at the top of the gorge. The side trail adds four-tenths of a mile to the trip. Beyond the spur trail, the main trail switches back and descends through a gap in the bluff line by way of a series of wooden steps. It’s a neat feature, but nothing compared to the next gap in the rock that lies ahead. Cracks in the Rock is one of the most popular geological features on the Kentucky side of the BSF. 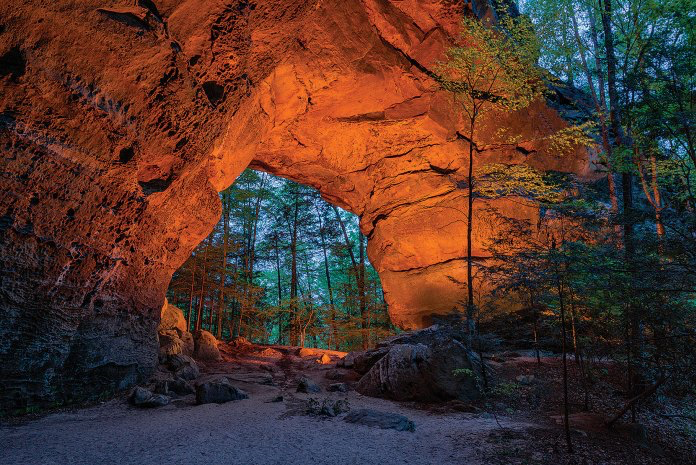 It is just as its name suggests — giant fissures through the sandstone, creating a natural passageway from one side of the ridge to the other. The trail passes through the tunnel, using another set of wooden steps to do so. Nearly two miles into the hike, the trail arrives at the abandoned mining camp of Blue Heron. This was the site of the Stearns Company’s Mine No. 18, which began operation in 1938 and closed in 1962, when the seam of coal played out. At its peak, the mine employed 200 people, and the community was complete with an elementary school, a Baptist church and a company store. When the mine closed, the town was deserted and the buildings left to ruin. 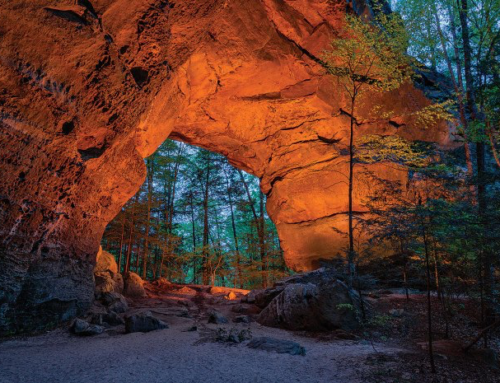 Today, “ghost structures” are used to tell the story of the mine and the workers who carved out a livelihood there. Hikers will want to take a little time to explore the old mining camp, and brochures are available to act as a guide through the camp. The trail continues beyond Blue Heron, and about a half-mile later passes near Devils Jump, the rapid that hikers observed from the overlook at the top of the gorge. There are side trails that lead to the river and to the rapid. The main trail, meanwhile, passes through an area that was once used as a Boy Scout camp in the 1950s, although there are no signs of the long-abandoned camp remaining. For the next mile and a half, the trail continues through the bottom of the gorge, passing a number of closed mine entrances that you can’t see just off the trail and a reclaimed mining site that you can see. The trail intersects with a horse trail for a short distance, before finally beginning its climb back to the top of the plateau. The ascent to the top of the gorge begins about four miles into the hike, climbing a series of wooden steps that lead up the side of the hill. For the next half-mile, the trail works its way up the gorge, finally leveling out about 4.5 miles into the hike. The final two miles of the hike are along the ridge top once again, at times nearing the paved road and at times venturing deeper into the forest, once descending yet another flight of wooden stairs away from the road. For the most part, the Blue Heron hike is easy enough, with the only difficult part being the half-mile climb from the river to the top of the gorge. 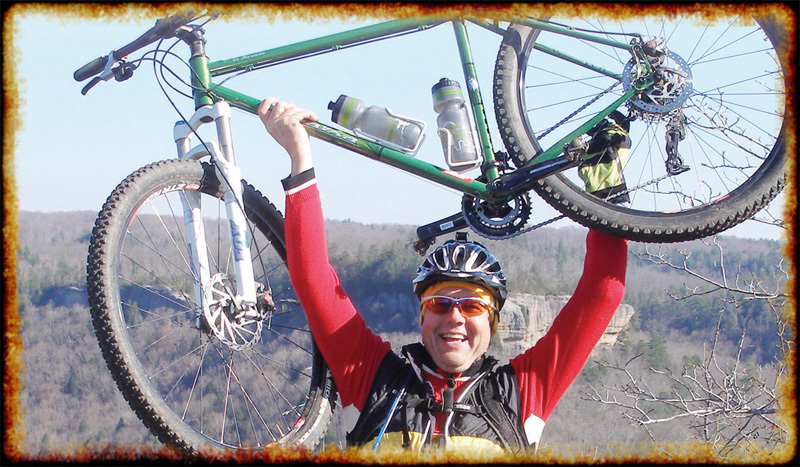 It’s a small price to pay for the scenery and the cultural lessons that the trail offers to its visitors. Getting There: Take U.S. Hwy. 27 north to Pine Knot, Ky. At the pedestrian bridge, turn left onto Ky. Hwy. 1651 and take it north to Revelo. Directly across from the Revelo Post Office, turn onto Ky. Hwy. 642, which leads into Blue Heron. 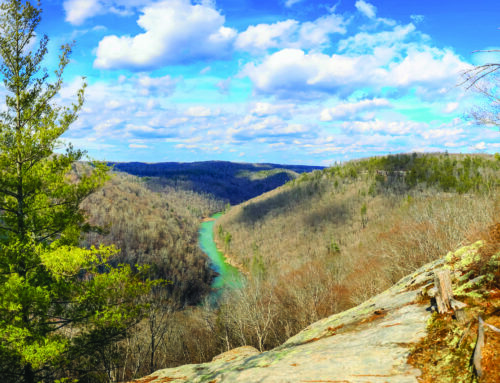 After entering the Big South Fork NRRA, and just past the entrance to Blue Heron Campground, look for the sign reading “River Gorge Overlooks.” Turn left there, and the Blue Heron Trailhead will be the first parking area on your left. Be Careful For: There are lots of steep, wooden steps along the hike, which can be slippery in wet weather. If “rock-hopping” along the river at Devils Jump, be extremely cautious. Slipping into the river can be deadly, due to the rapid’s strong undercurrent. Look For: There are several mine openings — now closed — along the trail after it departs the old Blue Heron mining community.